​A warm welcome to everyone and welcome back to the Art of Business English. This week I have another useful episode for you. 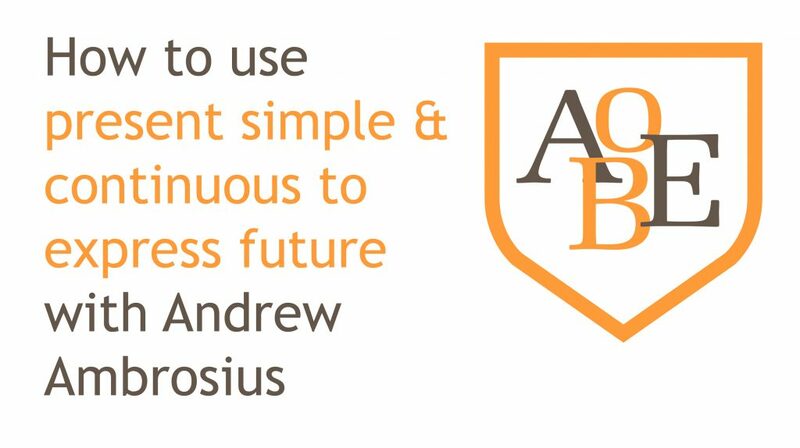 We are going to be looking at how we can use the present continuous for future plans as well as the present simple. You may be wondering how we can use present tenses for future actions, in fact you may be quite confused about how native English speakers use the present continuous for future plans. Haven’t we been taught that the present continuous is for actions that we are currently doing in the present? If you have every been confused about the present continuous and present simple being used to talk about the future then don’t worry. In today’s episode we are going to explain in detail the similarities and differences between how we use this in English and how it is used in Spanish. She’s not holding the meeting until next week. Am/is/are + s + verb (ing) + object? Remember that the contracted form of the present continuous is very common in spoken English. Another interesting aspect of pronunciation is that when we pronounce the ING form of verbs we often only pronounce the IN. Let me give you an example, I’m having a party, would be I’m havin a party. Jill and John are flying in next week. The new CEO is starting on Monday. Are you attending the meeting this afternoon? There are also some very common verbs that are used when talking about the present continuous for future plans. So, now that we understand how we use the present continuous for expressing the future, let’s take a look at the simple present for future use. ​I think the structure is clear for how we use the simple present. Remember it is simply, subject + verb + object and in the negative and interrogative form we use Do/Does with most verbs, with the exception of To be, must, can, and have got. So how do we use the present simple for future? Well, the following way. When we are talking about travel plans, timetables, programmes, etc. –things that cannot change in the future. The bus leaves at 8 am tomorrow. We can use this tense to talk about official plans and schedules. The president arrives next week. The present simple is used in much the same way as in Spanish, however there are some differences as well as similarities. Before we move on, I want to quickly cover temporals. These often cause a lot of problems for Spanish speakers. The first thing that you need to understand is that in English we do not have the subjunctive form. In most cases we use the present simple or present perfect. Basically, this means that future tenses cannot be used in a future clause with: when, as soon as, the moment, after, once, before, until, while and by the time (= when). The verb that follows these temporals must stay in the present simple or present perfect form. I’ll give her your message when she arrives at the office. So in both cases we can see that the verb when (cuando) in Spanish is followed by a verb in the subjunctive form (Llegue and hayas). The problem arises with English when a non-native speaker assumes that because we are talking about a future event we need to put a future clause after when. As such, the common mistake is when she will arrive at the office or when you will finish the report. As long as you are aware of this you won’t have any problems, and you will still be understood, it just sounds wrong to a native person. Let’s move on and take a look at some common time expressions used with these two tenses and then I’ll cover how they are used in comparison with Spanish. It is very important to use time expressions when using both the present continuous and present simple for future use. Why? Well, put simply time expressions help us indicate to the listener that we are talking about the future and not present actions. As you can see in the examples that I provided earlier most sentences have a time expression. If a time expression is not given then usually the listener understands from the context of the conversation that we are referring to plans and actions that will take place in the future. this week/month/summer, tonight, this evening, tomorrow, tomorrow morning/afternoon/night, next week/month/year, at the weekend, in January, in a few minutes/hours/days, on Thursday, on Wednesday morning, etc. OK, in the next part of this episode I am going to show you the similarities and differences between English and Spanish when using the present continuous and simple present for future use. Right, the first thing to point out is that most of the problems arise with the use of the present continuous for future use. It is very uncommon in Spanish to use the present continuous for future use, while in English it is completely the opposite. This Friday I am flying to Berlin on business. This sentence in English sounds fantastic and completely natural. However, let’s translate that directly into Spanish. Este viernes estoy volando a Berlín para negocios. Doesn’t sound very good does it. So here in lies the problem. We apply a different form of the future in Spanish. We would probably say something like. Este Viernes me voy a Berlín para negocios. We can clearly see that we are using the verb in Spanish to go, which is present simple. The present progressive form sounds very unnatural in Spanish, so here we must get used to using the present continuous in English. We are holding an investor meeting this week. Estamos celebrando una reunión de inversores esta semana. I’m seeing John this Thursday. Estoy viendo John este jueves. Are you attending the conference next week? Estas asistiendo la conferencia la semana que viene? Now, if we take a look at the present simple we can see that there are also some differences. This is incorrect in English. As you learnt in episode 29, we would use the future form will. You can’t use the present simple to express a future action this way. Remember, we use the present simple for official plans or for schedules such as flight, bus or train times. In this regard, the present simple is very similar to Spanish. My flight arrives on Monday at 9pm. Mi vuelo llega lunes a las 9 de la tarde. In summary, we can’t use the present simple for future actions unless it is for official timetabled events or plans or for things like travel arrangements and schedules. Let’s wrap up this episode with some example sentences in context. We have the next meeting on Monday at 10 am. Your flight leaves next Tuesday at 6am. As soon as you sign the paper work, my team will arrange the order. The sales team is meeting at the end of the month. I am flying out on Friday for 3 days. They are signing the revised agreement in the next few days. ​Well, that brings us to the end of this week’s episode. I hope you have found the content interesting and useful. Remember you can start to put this into practice straight away. I am sure you understand the structure for present continuous and present simple well so you shouldn’t have any problems starting to put it into practice. My recommendation is to start by writing down some simple yet common expressions that you can use in your next meeting, telephone call or email. It is super simple and a great feeling when you can easily master a new grammar aspect that you may not have used in the past. As always, I encourage you to share this episode with your friends, colleagues and family. I look forward to your comments and if you would like to appear on the AOBE podcast then please let me know as we are interested in offering you a live coaching session for our listeners. Get engaged as we love to help you out. Lastly, if you are not aware we are working on developing premium content for our listeners, keep an eye out for that. We will be launching the AOBE masters program soon. Till next time, take care and have a great week with your friends and family.